Representatives of Hadassah’s Linda Joy Pollin Cardiovascular Wellness Center were excited to receive an invitation to visit two Jerusalem schools in Arab neighborhoods where Hadassah’s Health and Nutrition programs are thriving. As you can see in the video, the students were very happy to have the opportunity to demonstrate what they had learned. The Pollin Center is working in 18 different Jewish and Arab schools in Jerusalem. 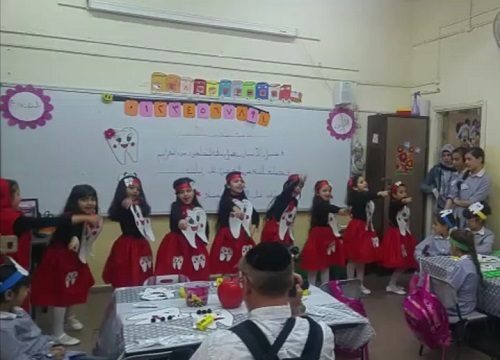 At the Al Salam (Peace) school in the Jerusalem neighborhood of Um Tuba, a corps of drummers in scout uniforms waited outside the school to welcome the representatives of Hadassah’s Linda Joy Pollin Cardiovascular Wellness Center for Women. The playground was filled with boys and girls, ages 12-21, where oversized chutes and ladders games had been modified to emphasize healthy food choices. In one corner, 15-year-old scientists were showing the benefits of toothpaste by coating eggshells and dipping them in vinegar. Others were singing odes to healthy eating. In the classrooms, students were eating fruit-and-vegetable rich breakfasts and on the roof, a “cafeteria” offered fruit shakes and popcorn. Nearby, was the school’s “victory garden” of herbs, such as basal and zaatar. Hana Arja, an occupational therapist who works in the school, said that having the children work in the healthy cafeteria helps them internalize the messages that they’ve been hearing–to cut out junk food, drink more water, and increase their exercise. According to Pollin Center Dietician Mona Aweda, who has given healthy eating lectures in the school, many of the girls hail from families where the moms have heard the lesson and later come to see her in the health fund clinics to talk about healthy eating and losing excess weight. Pollin Center representatives also visited the 850-student Issawiya Girls Elementary School, across Jerusalem, adjacent to Hadassah Hospital Mount Scopus. Their visit began with two plays. The girls were dressed as teeth, and a beauty contest was held between those that were brushed daily and kept free of sweets and others that were less careful of tooth health. The second play featured a trial of a smoker (with a girl dressed as a man). “He” was accused of hurting his own heart, liver, and lungs, as well as his family by refusing to stop smoking. In a sixth-grade class, the girls were weighing and measuring each other to check their body mass index (BMI). The Pollin Center healthy eating program has been operating in this school for four years. Its curriculum was created by then doctoral student, Dr. Maha Nubani-Husseini, currently the Pollin Center’s Director of Health Programs for the Arab Sectors of Jerusalem. Upstairs, in the classrooms, a panoply of music, art, drama, and salad-making demonstrations filled the school. “We have succeeded in creating a culture of good health,” said School Principal Afaf Kadumi. Also on hand was the principal of the boys’ school next door. Word is that the girls school has done outreach there and also to a nearby kindergarten to get the whole neighborhood on the same page for healthy eating.